13 Above: NASA Planed To Save Future 'Armageddon' !! It sounds like a Hollywood film script, but NASA has revealed plans to land a spacecraft on an asteroid. British scientists have designed a spacecraft which they claim is capable of saving Earth from a catastrophic asteroid collision. A team at British space company EADS Astrium has made the spacecraft, called “gravity tractor”, which will be deployed when an orbiting rock is detected on a collision course with Earth — in fact, it will intercept the asteroid and position itself to fly alongside it, just 160 feet from its surface.And, from this position, the ten-tonne craft will exert a small gravitational force on the rock, pulling the asteroid towards it. By gradually modifying its course, over several years, the gravity tractor will slowly shift the asteroid’s trajectory enough to ensure it misses the Earth. — big enough to release 100,000 times more energy than the nuclear bomb dropped by the US on Hiroshima in 1945. The plans were revealed in a NASA study by scientists at the Johnson Space Center in Houston and the Ames Research Center in California, which is due to be published next month. The experts envisage sending a small team of astronauts on a three-month journey to the asteroid, spending a week or two on the rock’s surface. The capsule would have to attach itself because asteroids, unlike the moon, have almost zero gravity. NASA's Marshall Space Flight Center has designed a nuclear-warhead-carrying spacecraft, to be launched by the US agency's proposed 's Ares V cargo launch vehicle, to deflect an asteroid that could threaten all life on Earth.The 8.9m (29ft)-long "Cradle" spacecraft would carry six 1,500kg (3,300lb) missile-like interceptor vehicles that would carry one 1.2MT B83 nuclear warhead each, with a total mass of 11,035kg. A kinetic "bullet" version would use this interceptor design, but have an inert warhead instead of a nuclear one. In both cases the lidar would acquire the target NEO at 5,000km (3,100 miles) distance, with TRP closing velocities of up to 10,000m/s (1,968,503ft/min). The Marshall study also has a solar collector option that has a very different vehicle design to the warhead and kinetic vehicles. The collector, which is more like an orbiter probe, would maintain station near the NEO and use a 100m-diameter inflatable parabolic collector membrane to focus sunlight into a "thruster" that directs that energy on to the NEO's surface. The heating of surface material evaporates it generating thrust and deflection. The spacecraft's target near-Earth object (NEO) is the Apophis asteroid, which will pass by the Earth within the orbit of the Moon in April 2029. 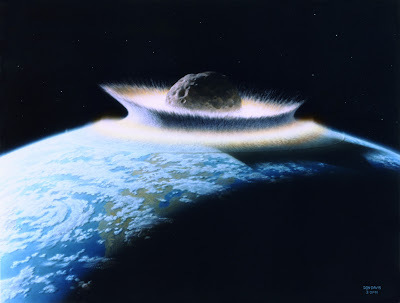 For the study, however, its orbit was changed to bring it into a "dead-centre" collision course with Earth and its mass was assumed to be 1,000,000kg. The spacecraft's possible launch dates were 2020 and 2021. 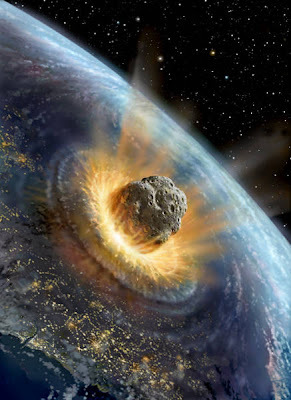 By the 2020's NASA concluded that "the nuclear interceptor option can deflect NEOs of (100-500m diameter) two years before impact, and larger NEOs with at least five years warning". Team member Ralph Cordey was quoted by the Daily Telegraph as saying: “Anything bigger than 30 metres across is a real threat to the Earth. Unfortunately it is a matter of when rather than if one of them hits us. The gravity tractor exploits the principals of very basic physics —every object with a mass has its own gravity that affects objects around it. It can move fairly large objects 300 metres to 400 metres across”. “These asteroids are hurtling around our solar system at 10km per second, so when you scale that up, you just need a tiny nudge to send it off course”, he added. The team has designed the gravity tractor and planned details of the mission. The craft can be built in a relatively short time, using existing technologies, if an asteroid were detected on a collision course. But, it is likely that it would require an international agreement to send a mission in space. “We’ve designed the mission using the technology we currently have available, so it could be put into practice at any time,” Christian Trenkel, who has worked on the mission plans, said. The Lander would have a constant thrust motor to keep it in contact with the NEO's surface in the low-gravity environment and have three seismic sensors on the end of three long legs with surface penetrating spikes. The seismic sensors would detect the effect of the observer's impactors' arrival.